A few days ago I saw this template (PSD file) at graphicsfuel.com. This is a website where you can find a lot of free PSD resources. So, I downloaded the PSD and just finished coding it in HTML & CSS. Now it’s available here for free download. It’s a template that you can use to create a website where you can sell an iPhone App or just distribute the app for free. However you can also edit it and create any site you want. 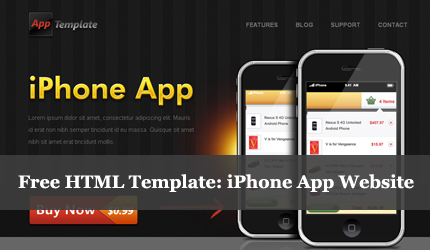 The template comes with a homepage, a features page, a support page and a contact page. It also has an image slider in the homepage for displaying the iPhone App’s screenshots. I have used jCarousel (a jQuery plugin) for the image slider. You can preview or download the template from the links below. Hope you like it! * You can use this iPhone App template in personal and commercial projects, but you can’t sell or redistribute it directly. If you want to publish it somewhere please refer to this page. For the jCarousel library use its license. I don’t know why are you getting this warning. I’ll check it. Let me know if you find anything so I can fix it. Thanks.